You tell me, is this the curse of the performance tester? or is this just another reminder that there are still plenty of orgs out there that might want to seriously consider investing in some training and/or services from a “top-shelf” performance tester — whether that’s me (’cause it would be nice to make some $ during my unexpected availability due to Skyrim’s unavailability), or someone else (’cause if Steam servers get less busy, it’ be nice to have some play time before getting back on the road) isn’t the point. The point is, as consumers, we deserve – and should demand – better. And as technologists we should stop pretending that what we’re doing is good-enough, and proactively make the appropriate investments in performance-related services, education, processes and attitudes before consumers rebel en mass (like they did when GoDaddy announced, then backed down, from strongly supporting SOPA earlier this week). Oh yeah, I almost forgot – I wish you all a great holiday season and hope none of your holiday plans are foiled by the Curse of the Performance Tester. Still connected, still downloading Skyrim updates. Down to 31Kbs. 40% complete. 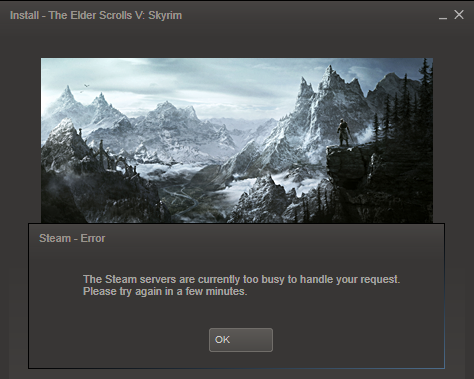 Dunno if it’s Steam, Bethesda, or even if the two are related, but I wonder if it would still be downloading so slowly if I’d spent the last 5 hrs doing some perf testing instead of periodically looking at the number to see if I’ll even get the game installed before my first con-call in the morning. Updates downloaded… time to install… wonder if I’ll even managed to stay awake long enough to get through character creation. Last night I installed the game on a new machine… went through the entire process and *averaged* 1.8Mbs for the download with a peak of 2.0Mbs. In theory, I should get up to 10Mbs for downloads through my service provider, so I’m curious whether there’s a 2.0Mbs speed limit on the server side, on my router, due to wireless signal strength, etc, but I think I’d rather spend my time w/ my kids, doing some billable work, and/or actually *playing* the game than research that right now. BTW, the game lives up to the hype, so in the end, I guess it’s worth it — making me just one more Netizen guilty of tolerating poor performance because “getting it done online eventually” is still better than the alternatives. And that, my friends, is the entire point. Every one of us that quietly tolerates poor performance is giving companies tacit permission to continue delivering poor performance. We are the reason we are faced with rampant poor performance, not the service providers. Companies simply aren’t going to put any more focus on improving performance than they have to in order to keep us at “quietly tolerating”. If we want better, we need to be less quiet about it… myself included.